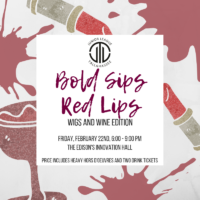 Don a colorful wig and share a glass of wine with JLT Members and friends at the Wigs and Wine Edition of Bold Sips, Red Lips. The event will be from 6:00 p.m. to 9:00 p.m. on February 22 at the Innovation Hall at The Edison. Ticket price is $40 and includes two drink tickets (one ticket can be used for a wine tasting flight and the second for a glass of beer or wine), heavy hors d’oeuvres, and silent auction. As the Junior League of Tallahassee is comprised of a wonderful group of diverse women and in the spirit of good times and great wigs, please respect any and all cultural headset and styles when making your wig selection.